If your spring break is early, or you just need to get away from the rain, the Queen Mary in Long Beach is offering California residents free admission March 1-15, 2009. Admission includes a self-guided tour of the ship and entrance into a Jet Blue drawing for a free airline ticket. Apparently the ship has the country's largest collection of Art Deco artwork, and there are related tours you can take (guided tours cost extra, as does parking). The Queen Mary was launched in 1934, and served in World War II. It transported Sir Winston Churchill three times, and also brought more than 12,000 GI war brides and children to the U.S. After completing 1,001 Atlantic crossings, the Queen Mary retired in 1967, when it changed from British ownership, to U.S. (or more specifically, to the City of Long Beach). 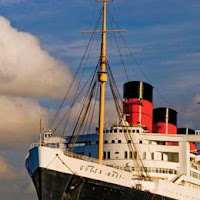 The Queen Mary operates a spa (who knew?) run by Dr. Will Rogers. Get a massage, hair cut, man's back wax, European nobility facial, Romanian sports massage and more. You can also spend the night in one of its staterooms, complete with iPod docking station and pay-per-view movies. Staterooms run $119-660.